Click here to share this information using our new format for social media, smartphones and tablets (also works on computers). If you are in the UK, tweet or email your Member of Parliament (contact details) with the link. Ask your MP to watch our presentation and download our briefing paper if they did not attend the APPG meeting. Also ask your MP to sign Early Day Motion 1189. If you are in Northern Ireland, Scotland and Wales, also contact your representatives in the devolved authority and ask them to watch the presentation and read the briefing. They have responsibility for many aspects of health policy. If you prefer, you can also share the video from this page or from youtube. Download our written report to MPs (pdf). 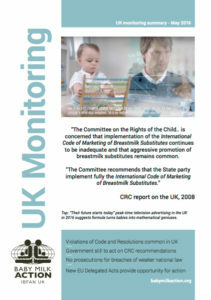 Access the new WHO/UNICEF/IBFAN Code Status Report 2016 that shows the UK has “few provisions in law” – unlike many other countries that are better regulating the formula industry.